Hi and welcome to my Red Couch! Please take a seat and relax. It's the end of the summer. You can feel the chill in the air. Last night I had the table set in my dining room. As I joined my husband on the deck while he was grilling, I realized what a nice night it was to dine on the deck. The thought also came to me that there won't be that many more nights to enjoy dining on the deck. So I moved everything to the deck and enjoyed dinner with my family on the deck. The star of the table is Mr. Parrot. My sister-in-law gave these plates to me recently. So of course I had to do a table with them. Thank you Camille! Here's a picture of the full place setting. The napkins are new to me and came in a set of four, orange, turquoise, white, and red. 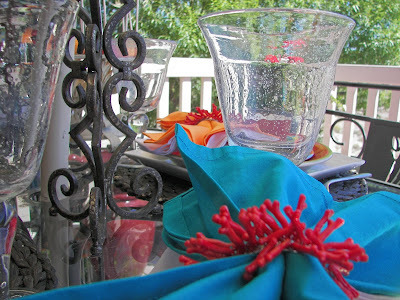 I also bought the coral napkin rings recently. I love the tropical feeling that the napkins give the table. My sister, Jacqueline at Purple Chocolat Home found these clear "bubble" stems at Tai Pan Trading, a Utah store, and gave them to me. Thank you! I love "bubble" glasses! Here's a view of the full tablesetting. I hope we eat late enough to light the candles tonight. Don't you just love the light of candles in your loved one's faces? Oops, there's a preview of my treat! I colored coodinated it with the table. Yes, I DID! Here's a close up of the dessert! 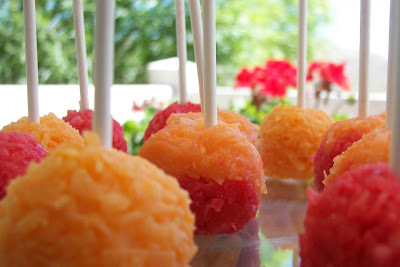 They are orange and cherry flavored and yummy and tropical! Please grab one before you go. I enjoy serving desserts on sticks. I think they are more fun that way. I will post the recipe and instructions for Coconut Treats on a Stick tomorrow. Here's a final view of my table this week! Hope you enjoyed your visit. I can tell you that it is always a pleasure to see you! 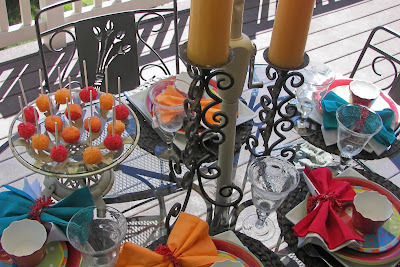 I am posting this with Susan at Between Naps at the Porch for Tablescape Thursday where if you visit you will be inspired to set a better table. Love the bubble stems too! What a delightful color palette for a summer dinner. What exactly was the dessert-on-a-stick? Wonderful table! 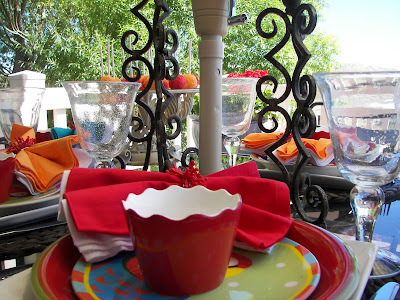 The dishes , napkin ring are special! Beautiful!!!!!Fatima-Scrapart. Love those napkin rings! And I want a coconut treat!!! Nooooooo - say it isn't over yet! Your table setting is beautiful and says that summer is going to hang around just a little bit longer. Oh what a fun table! I love those napkin rings and I knew I had seen them somewhere...Kmart you say! On sale! Yep tomorrow here I come! What a bright and fun desert also. Every time you mention Tai Pan Trading, Joni, I want one! Love this table- how fun! Those napkin rings are pretty nifty! KMart? I have to check this out. And your dessert looks delicious - the perfect food on the deck. What a pretty table. Love those napkin rings. Great table! 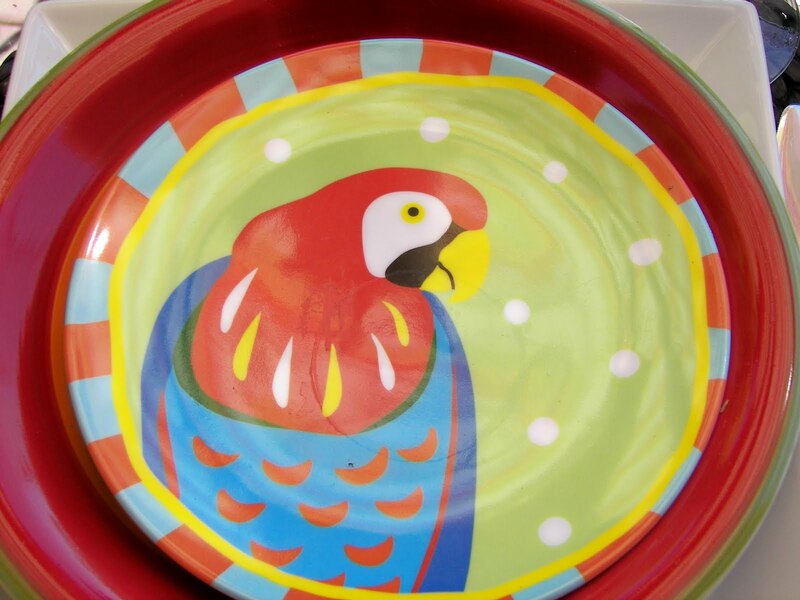 Those parrot plates are simply fun. Great job.. I love your happy table...cute parrot plates. The dessert on a stick looks delicious...looking forward to the recipe. Have a great week, Joni. You are farewelling summer as I am welcoming Spring! How fun! This is a fun table. 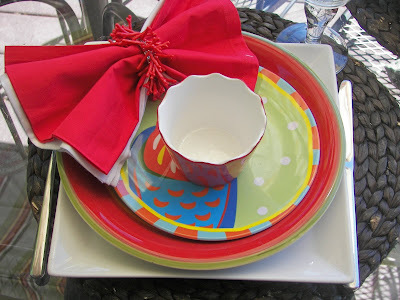 I think the napkin rings really make the whole thing...love the plates! I can't believe your dessert matches...pretty cool! Yum, those desserts on a stick are an incredible color! 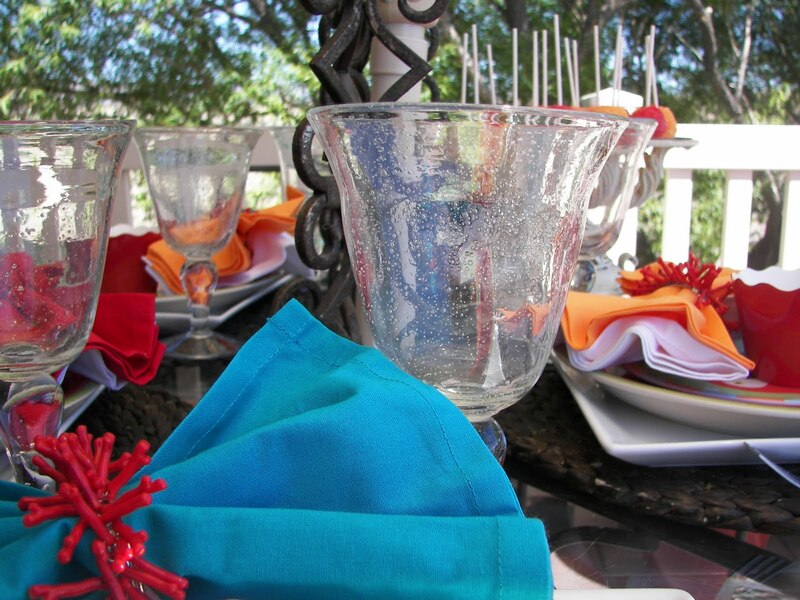 I love the napkins in those great colors too. It feels like summer has ended here already and it has been really cool, but I know the heat will come back. Can you believe Jessica finally figured out how to comment. She honestly has tried many times and I have tried to help her, but nothing worked. I knew I should have bought those napkin rings! So cute! Will be back tomorrow for the recipe to your treat. Oh you must have been reading my mind! Love your colorful tropical table. Those dishes are so fun! Fabulous table. I gotta get to KMart I think this table is so festive. Great job. Another beauty! Can't wait for the post on the coconut pops! Bright ,cheery and screams Summer, love it! Love the colors and tropical feel. It is still summer, I have been wanting to rush fall. The coconut pops look wonderful. Thanks for stopping by. LOVE it all! So glad to have found your blog...and I guess I'm your newest follower. I so enjoy cooking & baking. Fall brings me back to the kitchen. Hope you're having a lovely holiday!